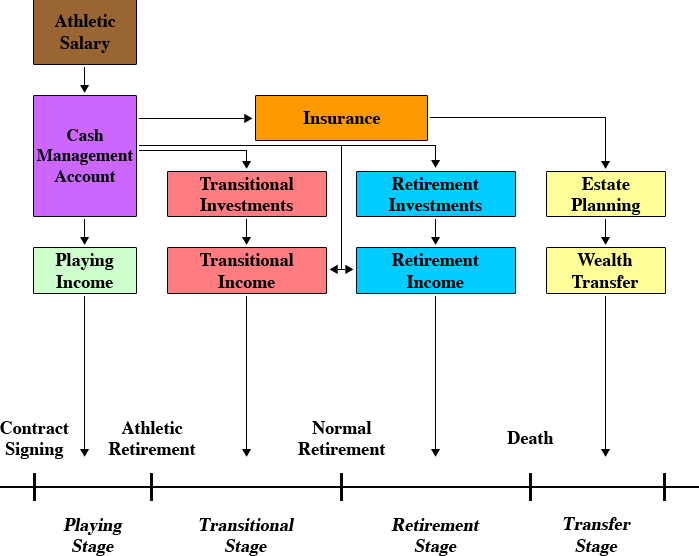 A Financial Plan for a professional athlete should be nothing more than a general road map for direction. However, the road-map must correlate with the landscape illustrated in the Professional Athlete Financial Lifeline. As well, the plan should be simple in concept and flexible. The amount of time a young athlete will have in the financial world is a long road and the pursuit of financial independence will have to be altered many times as the unique lifestyle, income situation and residential circumstances of a professional athlete changes. The following is a schematic to illustrate a template for my recommended planning structure.